I've been working on these socks for months. I think I started them in October, but they are ribbed all the way from top to bottom and I hated every minute of knitting them. I like the result though. 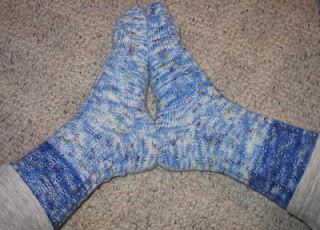 They are my first finished object from my own dyed yarn. Other people have made socks, but not me. 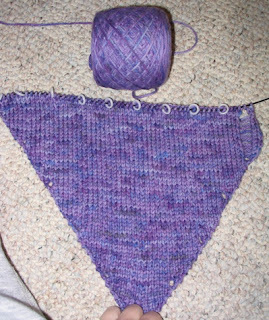 Anticipating their completion I started the Clapotis scarf from Knitty. 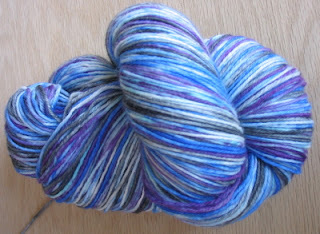 This is also my own hand dyed yarn. It's thicker than the sock yarn I've been doing and it's wonderfully soft and squishy. I'll post another picture of this one soon. Even since I took the picture last night it's lots different. I have a friend who has been knitting for many years but doesn't shop for yarn much. She's always facinated by the patterned sock yarns when she sees my socks. So I dyed up a batch for her. It was my first try with dyeing sections on the stove top. I was expecting three sections each of three solid colors. The verigation is so much neater. I really love this effect. And it's even striped! I can't wait to give it to her for her birthday next week. 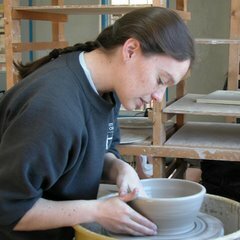 In other news, I've actually been in the studio this week making pots. It's good to be back at it. I've got lots to do to get my shops stocked and be ready for the studio tour in June. I still want a foot of snow, but I'm enjoying the warm week too. The frogs are out and croaking in the pond. and there is still plenty of time for a March snow storm, and I did get to have snow cream on Sunday morning with our pitiful inch of snow. So no more complaining from me. Wow, every single picture is something that looks better than the one before it - great job! You really have an artist's sense of color. I remember when you started those socks. I am sure they were boring to knit but the result is *FAB! * I love how the colors work together. Your Clapotis is going to be lovely too. And your friend is lucky to get your dyed yarn! And I love the color for the Clapotis. 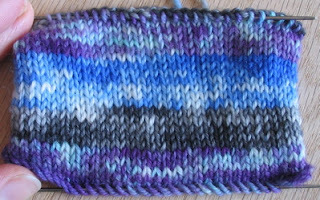 One helpful tip I heard when I did mine - instead of using markers for the stitches to be dropped, just purl them. They are easily visible as the ones to be dropped and you don't have to worry about the markers. Beautiful dye work on everything! I just love your dye jobs. Your artist's eye is really apparent no matter what you're working on. Lucky girl!